Blog Do Fish go to Sleep? To us humans, sleep is synonymous with warmth and comfort, and we all want to crawl into a large, comfortable bed at the end of a long day. As a result, it’s natural to question whether fish sleep at all, given that they are constantly suspended in cool water, trying to stay afloat. We’ll look at a number of commonly asked questions and the truth behind when and how fish catch up on their sleep. Do Fish Sleep at All? How do fish sleep in a tank? Do fish sleep upside down? Do fish sleep at night? Why do fish lay at the bottom of the tank? What if my fish aren’t getting enough sleep? Do I really need tank lighting to ensure my fish get adequate sleep? 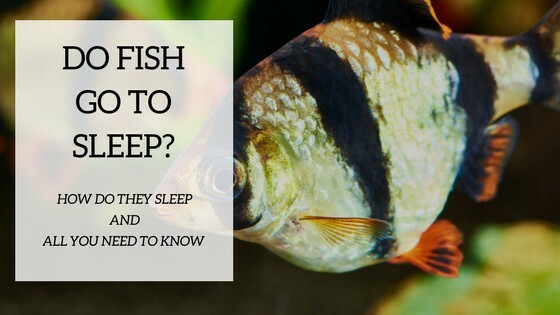 You could easily be mistaken for thinking that your fish don’t catch any sleep, given that they don’t lay down to take a nap. In fact, the last thing you want is to discover a bunch of your tank’s inhabitants lying on their side at the top of your aquarium tank’s body of water, which could mean something much more serious. The truth is, fish need sleep in just the same way that humans do, though the main difference lies in the way that they present themselves when they are sleeping. This is not always the same throughout different species. If you see a stationary fish not exerting a great deal of movement other than the occasional flick of their fin, then it’s likely that they are sleeping. Unlike many other land-dwelling species, fish do not lay down or shut their eyes whilst asleep, with the exception of some larger ocean-dwelling mammals who do have eyelids. What’s more, fish do not enter the stage of deep sleep experienced by humans, known as the REM cycle, and some species even continue to manoeuvre throughout the tank in a constant state of motion even whilst they are asleep. Regardless of the difference between fish and humans, and even different species of fish, the one common fact remains that when fish enter their various forms of sleep, their bodily functions slow down immensely, including their metabolism and energy expenditure, allowing them to rejuvenate and repair. Talking about specific body language that you might expect to see in your fish, there are many different signs that they may be in a state of rest. Some aquarists compare it to a sense of daydreaming, where your fish will typically find a secluded space at the bottom of the fish tank and enter a vegetative state. Seeing the occasional small movement is normal, as the fish attempts to keep itself steady. However, this is not a given for every species; some enter such a deep sleep, that they could be relocated from their tank to a new tank whilst in this state, without being woken. There are even species that envelop themselves in self-secreted chemicals, forming a cocoon of sorts. The one common characteristic is that they have greatly reduced movement during this period. If you spot a fish sleeping upside down, then this is definitely not normal behavior, whether asleep or not. Fish that float at the surface or the bottom of a tank, even when not sleeping, and who may also appear upside down, could be suffering from something called swim bladder disease. For fish with certain types of anatomies, such as goldfish, this disease can result in an imbalance of buoyancy, resulting in the tell-tale sign of your fish being less able to control their range of motion and alignment. If notice such a behaviour, it’s important to investigate the cause and take any appropriate action immediately, as soon as you spot it. Much like humans, fish are able to sleep whilst their tank lighting is turned on, though they find it much more preferable to sleep in darkness. Forcing your fish to be exposed to 24 hour light will cause stress and make it more difficult for them to achieve the restorative sleep that they need. Not to mention the other negative effect on your aquarium to leave lights on all the time. Therefore, you should ensure that when you go to sleep, you turn off your aquarium lighting system. Alternatively, you can purchase equipment that controls your lighting on timer switches, meaning that you can set up a cycle and not have to worry about it again. In terms of when fish sleep, not all species sleep during the night. Much like a number of land animals, there are species of fish that are nocturnal, meaning that they sleep during the day instead. 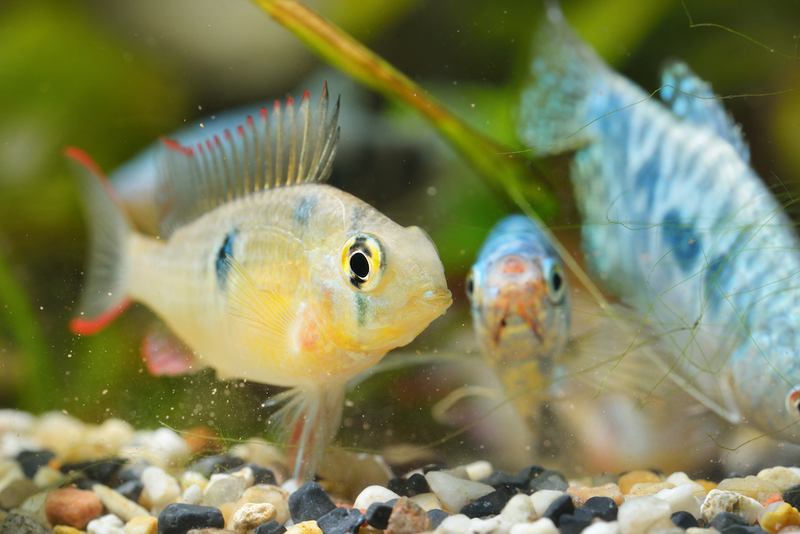 When you’re populating your aquarium with fish for the first time, be sure to learn about those specific species so that you know what is considered normal for your fish. So, now you know that many fish will choose to settle at the bottom of your aquarium when getting some rest. That said, if you see a fish exhibiting this behaviour, sleep is not the only potential cause. If you notice that your fish are laying at the bottom of the tank, gasping for air and exhibiting unusual levels of movement for a sleeping fish, then you may want to check the ammonia content of your aquarium’s water, as well as ensuring that your tank is getting sufficient circulation of water. A number of factors – poor circulation and excess ammonia included – can result in a layering effect within your tank, where oxygenated water can be divided into layers as opposed to the whole tank being filled with oxygen-rich water. Another potential factor to be aware of is the emotional response of a fish to triggers in their environment. Fish can become stressed or scared, which can manifest in diseases that lead to the fish floating at the bottom of the tank. Two of the likeliest causes are poor water quality or aggression from other inhabitants of your tank, so rule these factors out if your fish are behaving out of character. As mentioned earlier, you should aim to switch off tank lighting for a set period each day; a good practice is to turn off the lights when you head to bed. However, let’s imagine you jet off on holiday and leave your aquarium lighting turned on 24 hours a day. This could lead to exhaustion within your aquarium, and exhausted fish are more susceptible to illness than those that achieve an acceptable level of rest. In these scenarios, your fish would eventually fall to the bottom of the tank and sleep during daylight – be that artificial light or not – but it is far from being the ideal way for your fish to sleep. If you truly have to leave your tank for extended periods, somebody is going to have to be responsible for feeding your fish. Instruct that same person on how to control your lighting cycle to avoid causing unnecessary trauma and stress, or at least consider a timer switch. As a side note, many new aquarists question how long fish sleep for, and what an acceptable number is, but in reality, there isn’t a great deal of scientific guidance around this figure as mostly depends on the species. As good practice, many aquarist communities agree that 6 to 8 hours is sufficient, which perfectly mimics the human sleep cycle, too. Fish do sleep with their eyes open in the majority of species, though it’s not like they have a choice; with the exception of some larger ocean mammals, fish don’t have eyelids to close. This is another reason that many new aquarists or even layman fall under the misconception that fish do not sleep, as they will always appear to be staring straight back at you, even when they are in a state of rest. 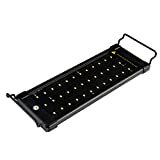 The reason that your majority of aquarists will choose to use a LED lighting system is because the level of lighting provided by daylight hours or by artificial / home lighting is not sufficient for your fish. Your routine may include early starts, late finishes, and even extended periods away from home. All of these breaks in a normal routine mean that your fish would receive irregular lighting cycles. Reaching every corner of the tank with natural lighting or a single source of artificial light within the room isn’t always feasible. Tank decorations and plant life can easily block rays of light, meaning many of your fish wouldn’t receive the constant light they need during waking hours. Changes to the natural cycle of the sun throughout the year would contribute to the irregularity of light exposure that your tank would receive. Direct exposure to natural sunlight as a source of tank lighting can result in temperature increases within your tank, which can affect the balance of the aquarium. By now, you should have a good understanding of how and when fish need to sleep, and characteristic behavior of what is ‘normal’ during this period. Be sure to turn off your tank lighting at regular intervals and be on the lookout for anything that might indicate that your fish are stressed, or that the tank water quality has degraded. Sometimes fish may looks like sleeping but the reason could be different and more serious. Always pay attention at their look and their health status, and if it is genuine sleep then let them enjoy the deserved rest! Your fish will thank you for it. 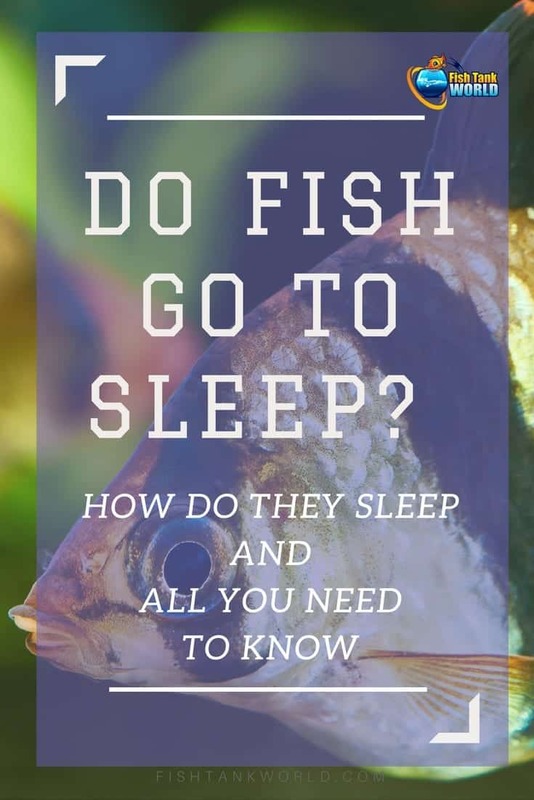 If you’ve a question about fish sleep cycles that we haven’t covered above, then feel free to drop it into the comments section below.